Holy Cross seminarians come from many different walks of life. Some come straight from high school and some from college. Others have worked or pursued graduate study before entering. They come from all over the country and have many different hobbies and interests. What they all have in common, though, is a commitment to discern whether God is calling them to serve His Church as a priest or brother in the Congregation of Holy Cross. Seminarians live together, study together, work together and pray together. A regular schedule of common prayer, common meals, academic courses, ministry and formation helps them to grow as Christian men and discern God’s will for their lives. No one enters a seminary completely certain about his vocation. For a man seriously considering priesthood or religious life, though, a seminary is the best place to discern a vocation. By living the life of a seminarian, a man grows in holiness and comes to understand whether this is God’s will for his life. Formation in Holy Cross begins in the Old College Program for college-aged men and in the Postulant Program for college graduates. 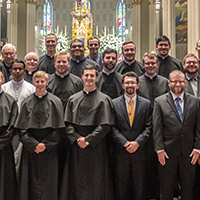 To help you learn more about seminary life, we have included virtual tours of our seminarians and posted profiles of our seminarians and seminary staff so you can meet them and better discern if you are called to be one of us. In this Overview of the Formation Process, in the Congregation of Holy Cross, we walk through the different stages that a young man will go through from entering into Old College or the Postulant Year through Final Vows and Ordination. The Old College Undergraduate Seminary is a formation program for college age men. Men enter as freshmen or transfer in as upperclassmen and are given the opportunity to consider more deeply their vocation while also working to obtain an undergraduate degree with their peers. The Postulant Year is a formation program for men ages 22-35 who have a bachelor’s degree. In this year they enter into a rhythm of prayer, religious formation, and study that gives them the opportunity to discern more closely whether Christ is calling them to the life of a Holy Cross priest or brother. Take a Virtual Tour of Old College and Moreau Seminary. These photo tours give a glimpse into what life in the seminary is like for our men in formation. Our men in formation all share a love of the Church and a deep desire to serve the Lord, but they are also unique individuals. They come from all over the country and bring a wide range of interests, experiences, gifts and talents to Holy Cross. Meet our seminarians from our first year Old Collegians to the temporarily professed preparing for Ordination. Our seminary programs in Holy Cross are staffed by Holy Cross religious dedicated to helping men mature and develop in all areas of their discernment and formation for religious life and priesthood in the Church. If you would like to schedule an informal visit, or would like to learn more about retreat opportunities, Contact Us.